White through Green, with room for more. My kids have been doing Tai Kwan Do for about a year and a half, and our policy for dealing with old belts has pretty much been just leaving them on the floor, or whipping them around occasionally for the cat to play with. Maybe not the best plan, but it has worked so far, and has the benefit of being really easy. Our Dojang has a display on the wall with the belts of our school’s founder, W.T. Alexander, and it is a big board, with the belts tied on. I wanted some middle ground between the pile of belts on the floor, and the enormous wall display, but I had no ideas. Until I saw a sample display of a lucite tube, with a dark wood base and cap, with the belts rolled into disks and stacked in the order they had been earned. The display was for sale for 50 bucks. Being the insanely frugal person I am, I thought to myself that I could do that for nothing. 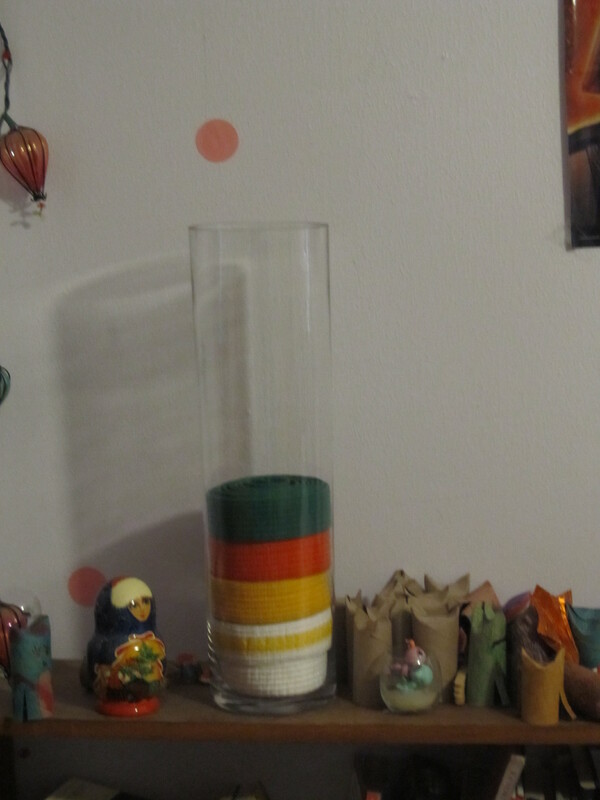 And I did try- I have a clear glass cylindrical vase, that has been laying around for years. I usually put lilacs in it. I rolled up Kate’s white belt, it fit perfectly. Excellent. Then I attempted her yellow striped belt, which I couldn’t make fit at all, It is just slightly thicker, so the disk as it is rolled up is just too big. I tried forcing it, and then visualized slicing my hand open and bleeding all over. A trip to the emergency room isn’t frugal at all, so I changed plans. Now, glassware happened to be 50% off at Hobby Lobby, so I scouted it out while on a trip for thread. Since I was only buying thread, I had ridden my bike over- one of my goals this spring and summer is to bike for short errands where I won’t be carrying much stuff. So, of course, I found the vases I was looking for. I considered very carefully. Hmmm…2 glass vases, 6 inches in diameter and 18 inches tall, in my panniers, over the railroad tracks… I decided to come back later. I went back later and brought them home, rounded up both kids’ belts, rolled them up and inserted them. I’m pretty psyched. Total cost of the two vases was $32, and I still have my big vase for lilacs. Every body wins. What a cool idea! It looks great, too.